See below and here for the latest on Senate Majority Leader Tommy Norment (R), one of the worst of the worst in terms of corruption in the entire, sordid “Virginia Way.” For more on Norment, see Pilot: Norment admitted to relationship with lobbyist in leaked letter, Federal investigators reviewed top Va. lawmaker’s relationship with lobbyist, and Virginia’s ethical vaccuum (“Sen. 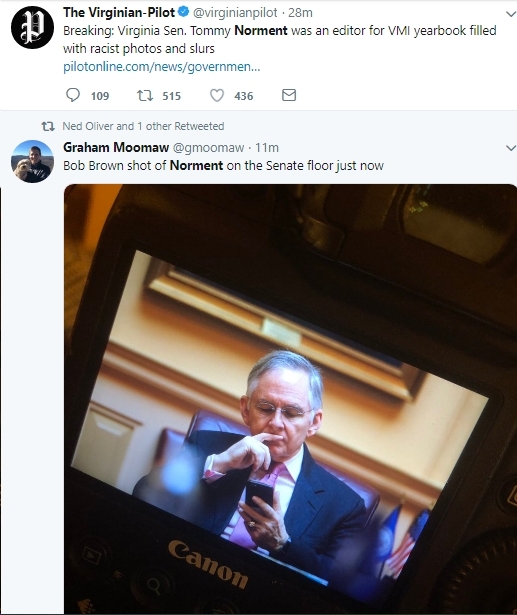 Thomas K. Norment Jr., Republican majority leader of Virginia’s Senate, is known for his folksy charm, snappy attire and relatively moderate politics. He’s also an avid hunter, as the tens of thousands of dollars’ worth of gifts he’s received from lobbyists suggest. According to his own disclosures, Mr. Norment accepted seven hunting trips worth about $19,000 between 2001 and 2007, and, since then, 12 trips that he described only as ‘travel,’ worth $29,688. Three of those trips were each valued at more than $6,000.”). So yeah, you don’t really get any scummier than Tommy Norment, yet he’s the LEADER of Virginia Senate Republicans. ‘Nuff said. 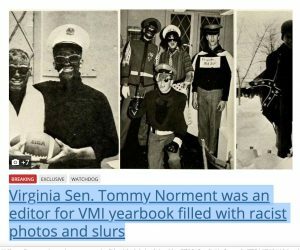 As for the breaking news, I’ve been talking to folks in recent days about how I hope we’re looking into the yearbooks and other background materials on Virginia REPUBLICANS – the party, after all, of racists/bigots/white supremacists like Corey Stewart, George Allen, Donald Trump, etc, etc. And that’s just the individuals making up their party; how about their disgusting policies, such as going to great lengths to minimize participation by minorities in our democracy? To make up a massive lie about supposed “voter fraud” in order to justify massive voter suppression? To redistribute $$$ away from poor, minority and disadvantaged communities to wealthy people? To cause environmental damage that will disproportionately harm those same communities? To block expansion of health care coverage that would help poor communities of every race, ethnicity, etc? Anyway, again, we need to be looking into these Republican guys’ (and they’re overwhelmingly guys, of course) backgrounds, and we need to be doing that NOW. If we’re not, why aren’t we? We certainly know that the right wing is looking intensely into Democrats, and we as party have a LOT less to hide or be ashamed of than the Republicans do!